Yesterday was Pi Day, March 14th (aka 3/14). To celebrate, I went out with JSL and purchased an apple pie. We also got a carton of vanilla ice cream. 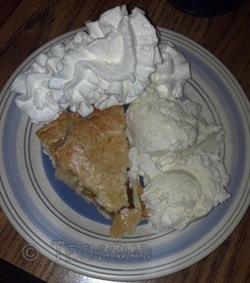 Once we got home, the pie was sliced and served with the ice cream and generous helpings of whipped cream. The boys might be too young to realize just what Pi means, but they enjoy any "holiday" where the celebrating takes the form of eating dessert. NHL even made me proud by realizing that we get "Ultimate Pi Day" (his terminology) in 2 years: 3/14/15.